Last summer I visited Poland in June. I longed for warmth and sunshine, because this year somehow the summer was reluctant to come to Pennsylvania. I have heard the news of unusually warm – for this time of year – weather in Poland and after a rather cold but otherwise wonderful visit in London I was eager to soak up the sun. I do travel a lot while I am visiting Poland. While there, I usually revisit some of the familiar and favorite places. I am also on the lookout for new ones, like this year’s Ojcow Castle. 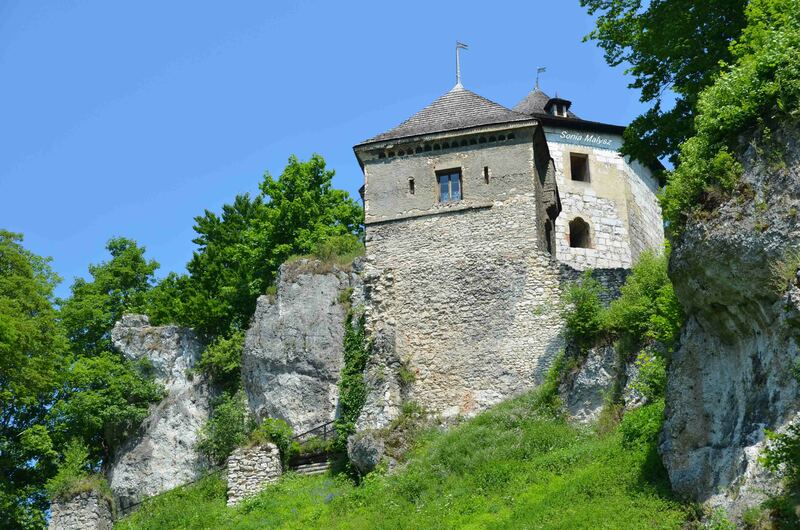 Perched on a rugged stony mountain, like all the castles on The Eagle’s Nest Trail, Ojcow served as a lookout for the enemy and the stronghold for its inhabitants and the surrounding population. 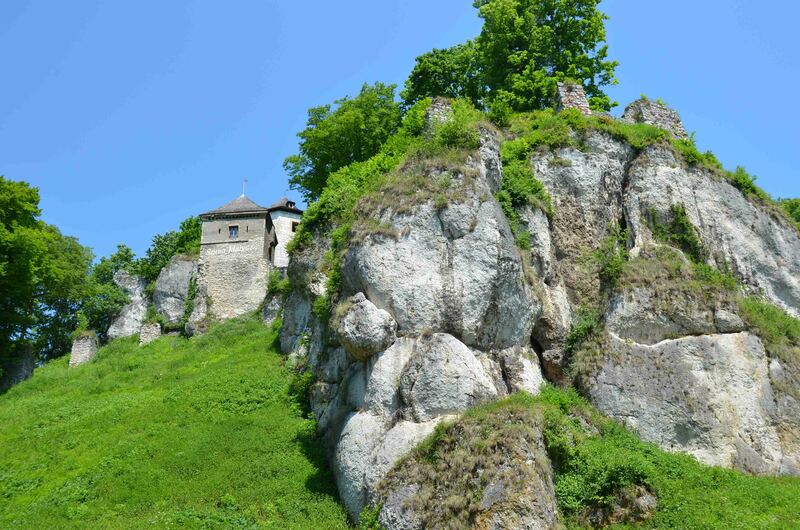 The castle was built in the XIV century by Polish king Kazimierz the Great. Its name, Ojcow, comes from the polish word for “Father” and serves as a commemoration to the king’s own father, Wladislaw. After years of prosperity, the castle declined over the next few centuries. The last blow came when it was attacked by Swedes and fell into farther ruin. In the XVII century it was renovated and expanded, but afterwards it again deteriorated so much, that it needed to be demolished because it threatened to collapse. Today, all that is left of it is the tower ( which is rebuilt ), the gatehouse, and the perimeter walls. 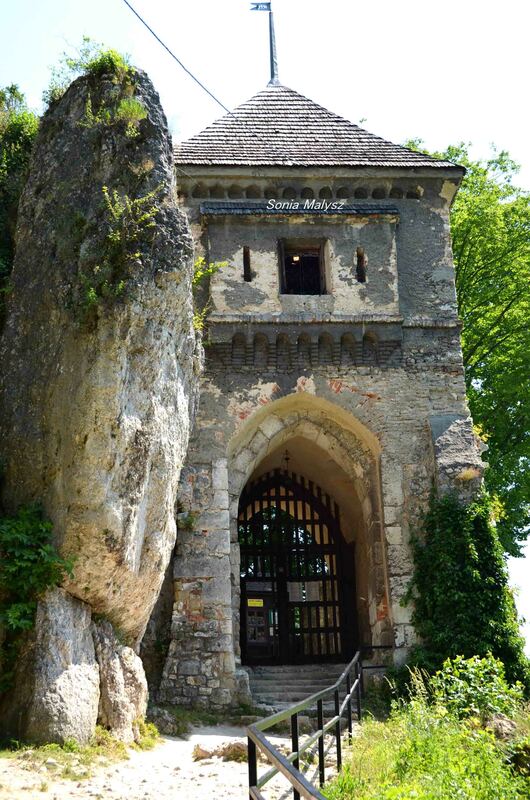 The mountains leans close and hugs the ancient gatehouse. Both weather beaten, they look like two friends enjoying a few laughs. If you are interested in other places I have visited in Poland, you can check out Bobolice, Ketrzyn, Gliwice, Krakow, and Zabrze. Już się nie mogę doczekać, gdzie się w tym roku razem wybierzemy! Wow! A very great place and castle. Nice pictures with that blue sky. You can feel the history when you look at those pictures. Oh I invite you wholeheartedly to Poland. It is one of the most beautiful places I know. Does your family come from Poland? Oh no. I’m from Croatia, that’s a similar country. I have never been in Poland, and I would really like to visit that country. You are from there?